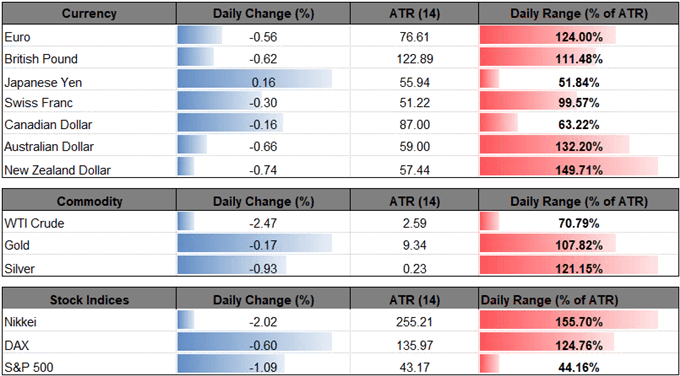 AUD/USD slips to a fresh monthly-low (0.7155) as lackluster data prints coming out of China, Australia’s largest trading partner, rattle the economic outlook for the Asia/Pacific region, and the advance from the 2018-low (0.7021) may continue to as the pickup in volatility spurs a further shift in retail interest. AUD/USD is back under pressure even though China pledges to suspend the additional 25% tariff on U.S. autos for 90-days, and it seems as though the trade truce has done little to alleviate the outlook for global growth as Chinese retail and industrial numbers come up short. The RBA’s wait-and-see approach for monetary policy puts increased emphasis on the Federal Reserve’s upcoming interest rate decision slate for December 19 as the central bank is widely expected deliver a 25bp rate-hike, and the deviating paths for monetary policy may produce headwinds for AUD/USD as Chairman Jerome Powell & Co. look to carry the hiking-cycle into 2019. With said, AUD/USD remains at risk of giving back the advance from the 2018-low (0.7021) as both price and the Strength Index (RSI) snap the bullish formations carried over from October, but retail traders continue to fade the weakness in the exchange rate as the pickup in volatility fuels a pickup in net-long interest. 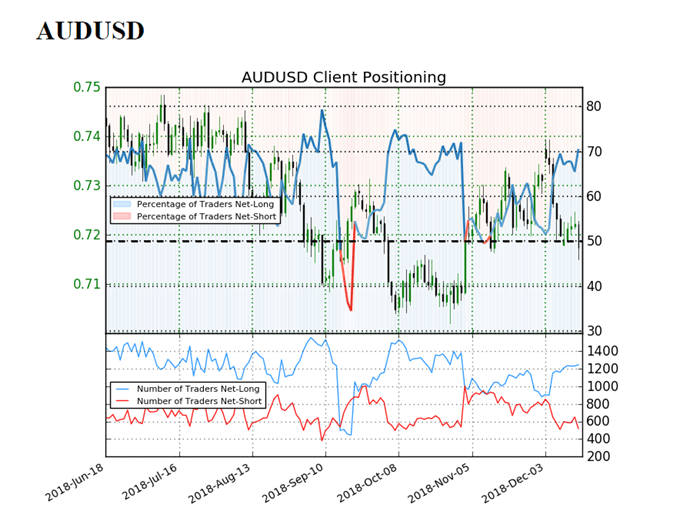 The IG Client Sentiment Report shows 70.5%of traders are now net-long AUD/USD compared 63.3% at the start of the week, with the ratio of traders long to short at 2.4 to 1.In fact, the percentage of traders net-long is now its highest since October 26 when AUD/USD traded near the 0.7080 region. The number of traders net-long is 3.0% higher than yesterday and 2.4% higher from last week, while the number of traders net-short is 25.4% lower than yesterday and 14.8% lower from last week.